This post is sponsored by Bob’s red mill. Thank you for supporting the brands I love and use in my own kitchen. As always, all thoughts and opinions are my own. With the holidays right around the corner (and a baby on the way! ), December is shaping up to be a busy month for my family. In year’s past, it has been my holiday tradition to spend days in the kitchen meticulously cutting out and decorating my favorite holiday cookies—like these honey, sugar, and chocolate sugar cookies—to share with my family and friends. This year I honestly don’t have the time to spare. Instead, I’m going to feel out a new holiday baking tradition. My goal is to spend the next few days filling the freezer with cookies from easy-to-make recipes, and enjoying the remaining days by relaxing before our sweet baby arrives. 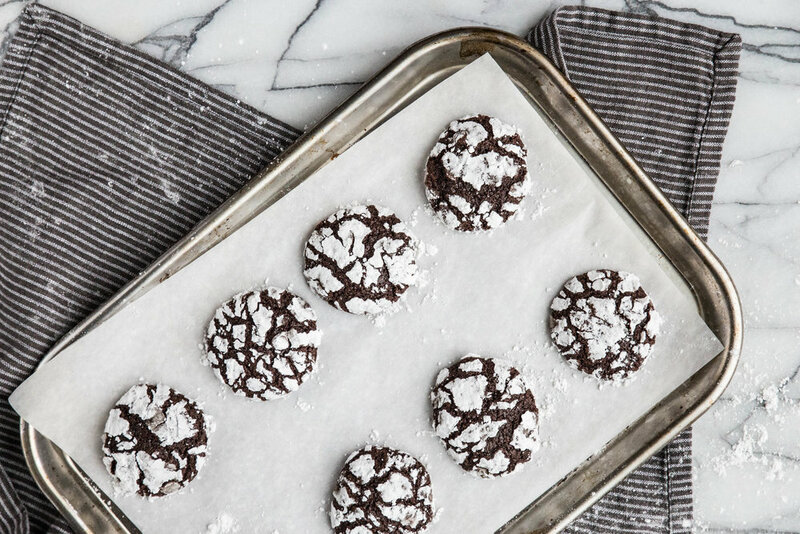 These Chocolate Ginger Crinkle Cookies meet all of my criteria this year: simple to make, freeze well, and quickly disappears from the serving plate. For this cookie recipe, I turned to Bob’s Red Mill Unbleached White All-Purpose Flour. I prefer to use unbleached flour in my baking because it means the flour is not chemically treated. To create the classic light colored appearance and delicate texture of all-purpose flour, the wheat bran and germ are removed during the milling process (which is the key difference between whole wheat and all-purpose flour). Crinkle cookies get their crackled appearance from being rolled in powdered sugar before baking. The sugar draws out moisture from the outside of the cookie, causing the edges to dry out before the interior is finished baking. This difference in moisture levels causes the top of the cookie to take on a crinkled appearance. With a handful of chocolate chips to provide a richer chocolate flavor and ground ginger and cinnamon to give the cookie a spiced warmth, these cookies are sure to satisfy your sweet tooth this holiday season. One of the qualities I look for in a good holiday cookie is its ability to freeze well. Knowing I have homemade cookies stashed away that can be ready at a moment’s notice is a relief during a busy season when events pop up or unexpected guests drop by. Happily, these chocolate ginger crinkle cookies can be easily frozen using two methods. The first method is to form the cookie dough into balls and freeze them before rolling them in powdered sugar. When ready to bake, the frozen cookie dough balls can be rolled in the sugar and head straight towards the oven. This method is great when you can spare a few minutes to bake or you want to serve hot cookies straight from the oven. The second method is to bake the cookies as directed and allow them to fully cool before placing them in an airtight container in the freezer. When ready to be served, pull the cookies from the freezer and allow them to thaw. This method is best when you anticipate the cookies being eaten quickly since the powdered sugar can become sticky if the cookies are left out for longer periods of time. 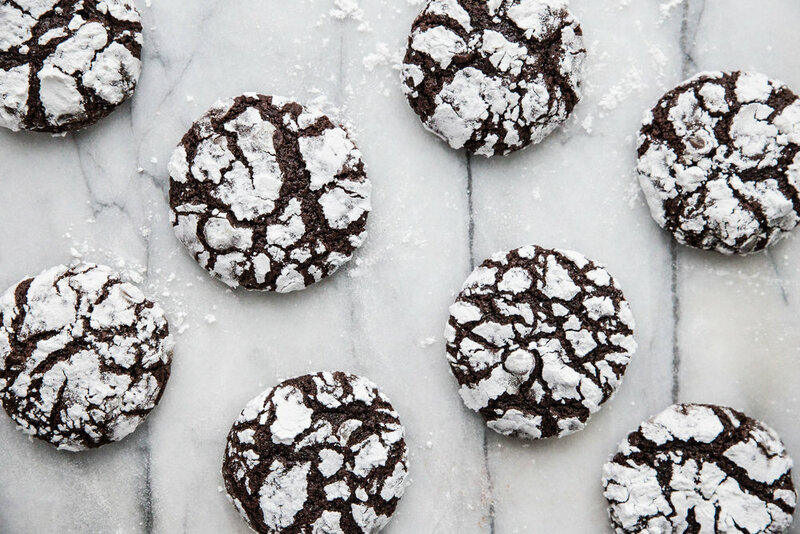 These Chocolate Ginger Crinkle Cookies are a seasonal take on the classic cookie. The chocolatey cookies are spiced with ginger and cinnamon to bring out traditional holiday flavors. After chilling the dough, the cookies are dipped in powdered sugar and baked until they take on a crinkled appearance. These cookies are best served alongside friends and family with a tall glass of milk. 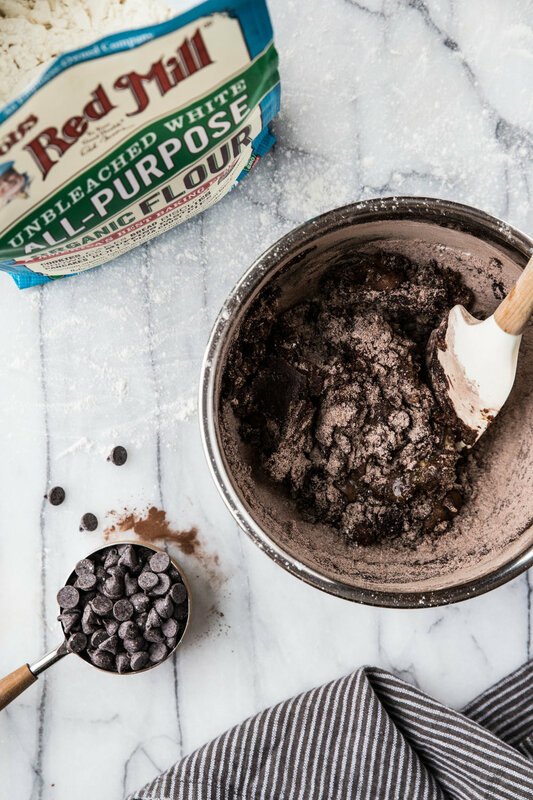 In a large mixing bowl, whisk together the flour, cocoa powder, granulated sugar, brown sugar, spices, baking powder, and salt. Mix in the vegetable oil, eggs, and vanilla, stirring until a uniform batter forms. Stir in the chocolate chips. Place cookie dough in the refrigerator for 2 hours (or overnight) until completely chilled through. Place powdered sugar in a small bowl. Set aside. Roll chilled cookie dough into 1-inch balls. 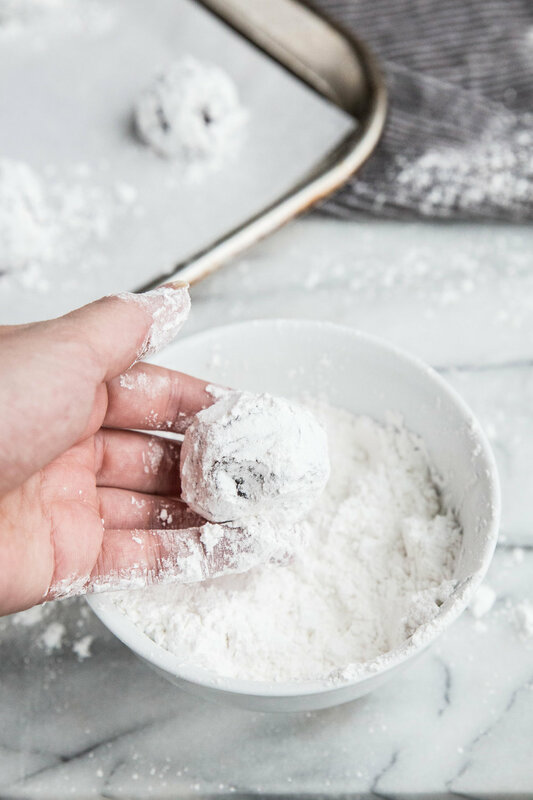 Drop cookie dough balls into the powdered sugar and coat evenly on all sides. Place balls at least 2-inches apart onto a cookie sheet. Bake for 10-13 minutes, or until cookies have a crackled appearance. Allow cookies to cool for 5 minutes before transferring them to a cooling rack to cool completely. As a teacher, January is a busy month. With one semester coming to an end and the second semester beginning, the workload feels like it doubles, and my intentions for the new year are put to an honest test. When I finally do get home for the evening, I sink into the couch and settle in for a night in front of the television. It turns out the tension and stress of high school finals week can be hard to shake off—even for a teacher. As my personal history has shown, when hunger strikes during these busy times I tend to choose the easiest (and often the least healthy) option—takeout and candy bars, anyone? For this reason, I have learned to prep a few dinners and snacks in advance. With flavor and convenience in mind, I have partnered with Dole Sunshine to #SharetheSunshine by bringing you a recipe for mixed berry oatmeal bars that will add a bright spot to your busy weekdays. During winter months, I prefer to use frozen fruit in my baking because it provides consistent quality while maintaining a bright flavor. As an added bonus, using frozen fruit avoids the process of sorting, washing, and slicing that comes with fresh fruit, which is a real timesaver when you have a busy schedule. 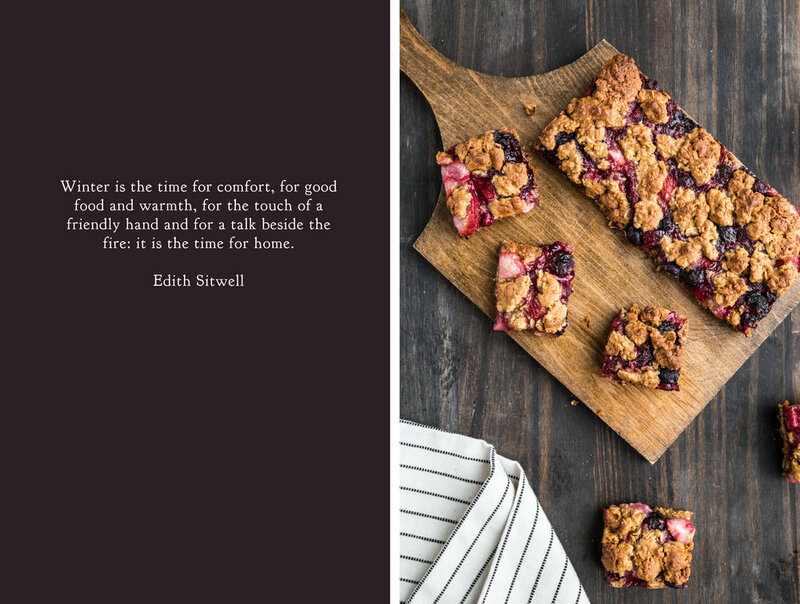 For these mixed berry oatmeal bars, I used a variety of strawberries, blueberries, raspberries, and blackberries, but you could customize the bars to the berries of your choosing. In the oven, the berries bubble down into a sweet, fruity filling. Many of the larger berries partially hold their shape, delivering pockets of bright flavor throughout. The oatmeal crust bakes up soft and chewy, which provides a texture reminiscent of cereal bars. After these bars finished baking, I cut them into 2-inch squares and wrapped them up individually to toss into my lunchbox for an afternoon pick-me-up. The next couple weeks may be busy for me, but I'm ready for the challenge. Mixed Berry Oatmeal Bars are simple to make and bring out a bright fruit flavor. An oatmeal crust—made from oats, honey, and brown sugar—forms the base of the bars. Frozen berries are spread throughout the middle, which bubble into a sweet filling in the oven. The bars bake up chewy on the edges and stay soft in the middle, making for a quick and delicious snack on a busy weekday. Preheat oven to 350 degrees F (180 degrees C). Lightly grease an 8 x 8-inch pan. For the oatmeal base, beat together the butter and brown sugar until uniform in a large mixing bowl. Beat in the egg, honey, and vanilla, mixing until blended. Stir in the oats, flours, ground ginger, baking soda, and salt. The batter will be slightly sticky. Using greased hands, press 2/3 of the batter into the bottom of the prepared pan. Set aside. For the mixed berry filling, cut down any large frozen berries to keep the fruit about the same size. In a medium mixing bowl, stir together the frozen berries, sugar, and cornstarch. Spread the berry mixture evenly over the top of the oatmeal bars. Crumble the remaining batter on top. Bake for 40-45 minutes, or until lightly browned. Allow to cool slightly in pan before serving. This post is sponsored through a partnership with Dole Sunshine. As always, all thoughts and opinions are my own. I am incredibly excited to be working with Dole Sunshine because of the excellent quality of their frozen & preserved fruits. Thank you for supporting Pastry Affair & my wonderful sponsors! This honey cookie recipe has been passed down through four generations in my family. Shared between mother and daughter, grandmother and granddaughter, and cousin to cousin, this recipe is weaved throughout our family history. The honey cookies are guests at our holiday celebrations, making their appearance when family is gathered. Growing up, the honey cookies were served out of large vintage yellow Tupperware container, brought in from the cold garage after the evening meal. By this time, the dessert table was already full, arranged with candies and cookies of all flavors and textures on brightly colored holiday plates. Since the honey cookies were a late arrival to the party (we would have certainly spoiled our appetites if they arrived sooner), they were placed on a nearby dining room chair. It didn't matter that the cookies were cold, or that they were not presented just so—everyone knew they were the genuine star of the holiday table. Memories of holidays past bring up images of family laughing around the table, cousins sneaking extra cookies in pockets and up sleeves, and my grandfather reminding everyone, again, how much he loved these cookies. These honey cookies are a modest spiced cookie, no flashy sprinkles or bright colors, but it is their simplicity that makes them beautiful. The recipe for these honey cookies is traditionally of German heritage, prepared over the stove instead of in a mixer. The sugars are brought to a boil before the mixture is combined with butter, eggs, and sour cream. Once the flour is stirred in, the soft dough is chilled in the refrigerator to stiffen. The baked cookies have a unique texture—soft, yet substantial. These honey cookies hold so much nostalgia for me. The smell brings out the savory and sweet scents of Christmas Eve dinner. The sight carries images of my late grandfather telling everyone another story, cookie in hand. The taste—well, the taste is of home. May these cookies bring you and yours as many memories as they have given me. These soft Honey Cookies embrace the comforting flavors of the holiday—cinnamon, nutmeg, cloves, and anise. The spices come together beautifully and the addition of sour cream make these cookies soft to the touch and to the taste. An anise glaze may be added for a touch more flavor and a hint more sweetness. The cookies bake up smooth, which is perfect for decorating if you choose to do so. Share these cookies with family and friends during your holiday celebrations—perhaps you'll start a new tradition. In a large saucepan, bring the honey, brown sugar, cinnamon, nutmeg, ground cloves, and anise extract to a boil over medium-high heat. Once boiling, turn off the heat and add the butter and coffee. Allow mixture to cool to room temperature before adding the eggs, sour cream, baking soda, and baking powder. Stir well. Gradually mix in the flour to form a soft dough. Refrigerate for 6 hours or overnight, until the dough stiffens considerably. On a heavily floured surface, roll out dough to 1/4-inch thickness. Cut out 2-inch round cookies (or other shapes), re-rolling dough as needed. If you don't have a round cookie cutter, a water glass will also do the trick. Bake for 12 minutes, or until cookies are lightly browned and puffed. Cool completely before glazing. In a small bowl, mix together powdered sugar, anise extract, and heavy cream. If glaze is too thick, add more cream 1 teaspoon at a time until glaze is spreadable. Spread glaze onto cookies with an offset spatula and allow cookies to rest until glaze to set before serving or storing. * 3/4 teaspoon anise seed can be substituted for the anise extract. 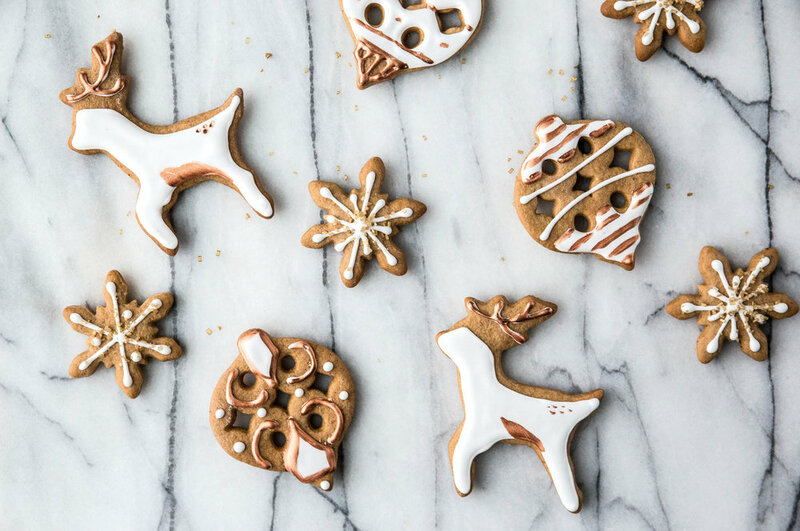 **In the photographs shown above, I decorated the cookies with a royal icing flavored with anise extract, but honey cookies are traditionally spread with or dipped into the anise glaze.